Saves the drawing immediately, without displaying the Save dialog box (short for "quick save"). 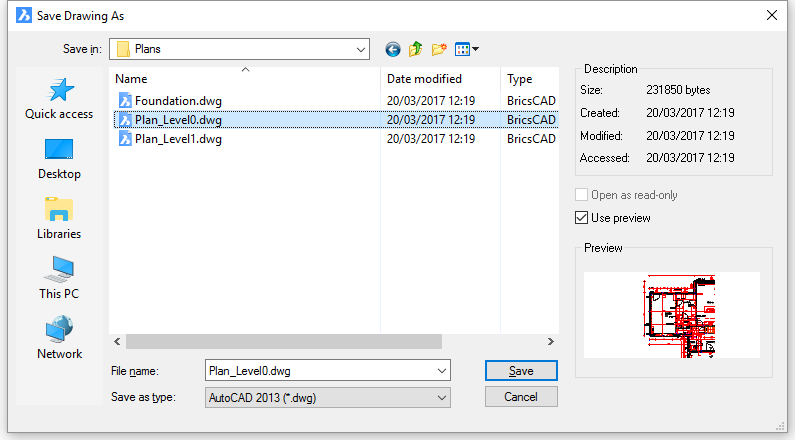 (Optional) Enter a file name or accept the default name generated by the program, such as 'Drawing1.dwg'. (Optional) Choose a folder in which to save the drawing. (Optional) choose a file format from the Save As Type droplist. Click Save. See the Save command. Displays no dialog box or prompt in the command bar. To save the drawing by another name, use the Save command. Save - saves the current drawing through a dialog box. SaveAll - saves all open drawings. SaveAs - saves drawings by another name. SaveAsR12 - saves drawing in older formats. Export - exports drawings in a variety of vector and raster formats.